Bocce Ball | Athletic | Turf Tek USA ‹ FREE SAMPLE! Turf Tek USA uses the highest quality Infill available on the market today. This combined with G rated sports field padding, provides a finished product that is ideal for any sport court for horseshoes, croquet, or bocce. Cleaner – footwear and clothes stay clean! Maintenance Free – no need to water or mow! No Down Time – with our quick drainage system! Safe – No chemicals, fertilizers or pesticides needed! Green Year Round – Year-round playing is now possible! Turf Tek USA sport courts offer the best speed, pace, and accuracy, allow for multi – directional playability, allow you to play all year long, are durable and maintenance free and can be installed outdoors or indoors! Bocce can be played on almost any flat surface but the best surface is one that has minimal bounce and has no grade so balls don’t end up assembling in one spot during play. Other important considerations are maintenance and drainage. Often courts are constructed using compacted rock, sod or sand which tend to drain poorly, become bumpy or uneven. 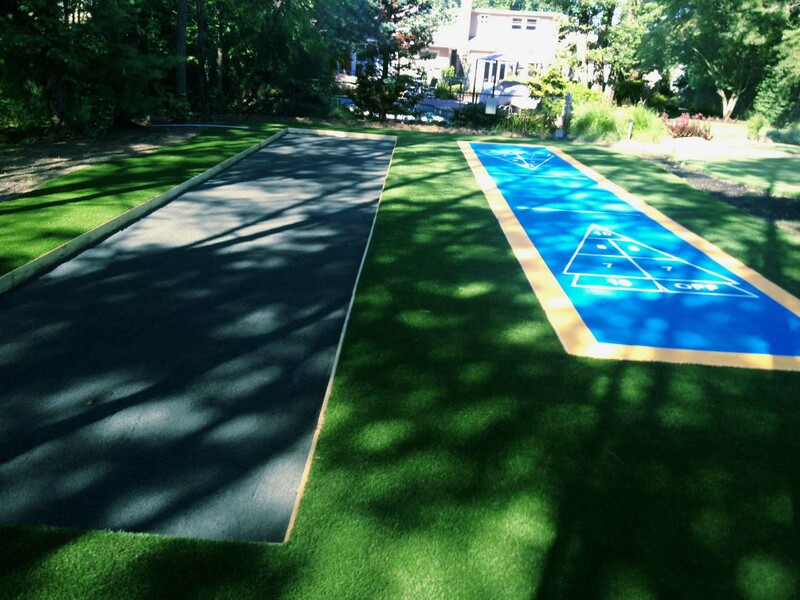 A Turf Tek USA bocce court is arguably the ideal choice with the look and feel of real grass. Turf Tek USA bocce courts are maintenance free, allow for fast, bounce free ball handling and are cooler and cleaner under foot. Turf Tek USA shuffleboard courts are a cost conscious and low maintenance alternative to kits or traditional stained concrete courts. Our shuffleboard courts can be installed indoor or outdoor and directly onto nearly any solid flat surface including driveways, patios, and decks or integrated into your lawn landscaping. Our shuffleboard courts look great, drain great, are maintenance free, and provide optimal disc glide for competitive play.